Slatwall panels measure approximately 8ft x 4ft and are manufactured here in the UK using ethical production methods and cut using high precision beam saws. Each order we pack, dispatch and send to most UK destinations within 24 hours. 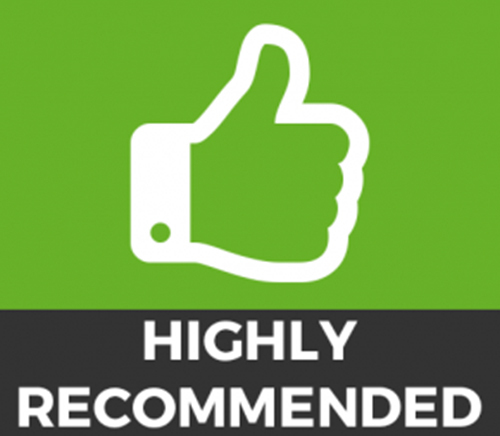 We include a fitting service option to most areas with most areas covered if needed and have Testimonials galore if you need to check both quality of panel and service. The panels themselves are finished with easy to clean, scratch resistant laminate and are available in a subtle range of finishes. A new improved range of accessories are now also available including hooks, arms, acrylics, rails, glass and timber shelves and more. 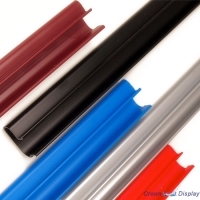 We highly recommend the use of our Flexi ‘Grip-Tight’ pvc inserts for added stability for your accessories and you may be pleasantly surprised at the funky colours to choose from. 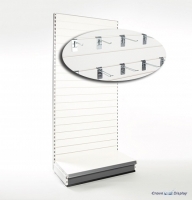 For timber shelves and the display of heavier products we recommend using aluminium inserts to protect your panels and merchandise. 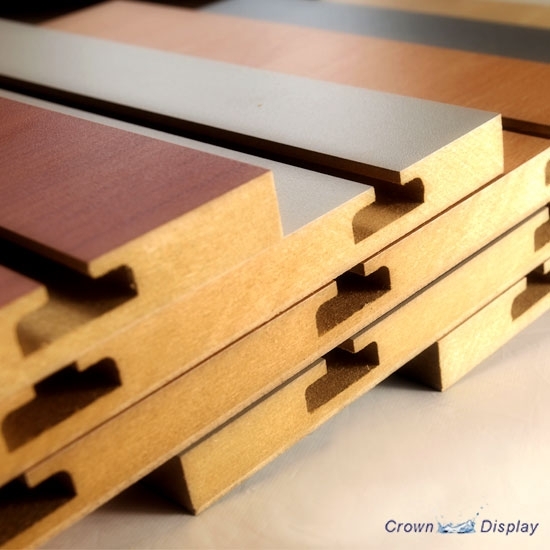 Aluminium inserts add strength and support to your panels, increasing their lifespan whilst looking easy on the eye. Each year that passes we are frequently surprised by the endurance and popularity of Slatwall. A real customer cost effective favourite it seems. 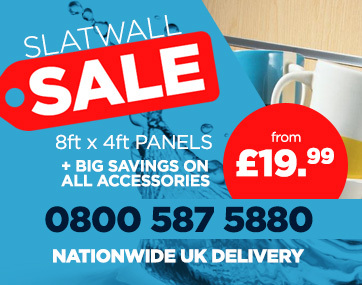 Slatwall Pitch: Our standard Slatwall panels are 100mm in pitch. 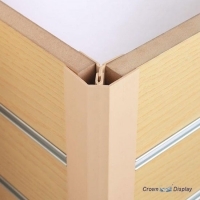 This means there is 100mm space between the top of one groove and the top of the next groove. 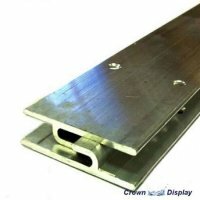 You can customise your groove pitch although frequent alternatives to the 100mm are the 50mm or 75mm options - but dont forget you may need more inserts. 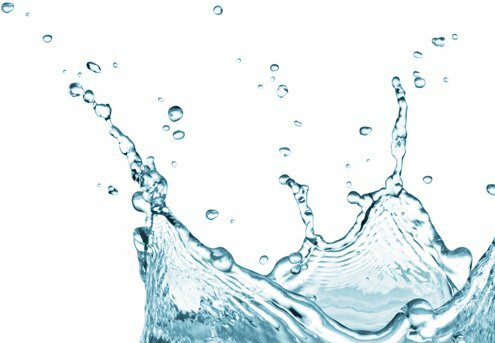 As an additional service we are also happy to cut and trim and customise your panels to any size, just give a call on 0800 587 5880. 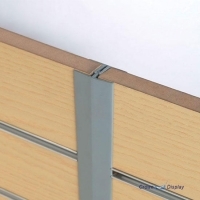 Our new Slatwall Easy Hang Battens make hanging your slatwall panels easier, and you can enhance your slatwall display by using profiles such as end caps, corners and joining strips to hide those unwanted rough edges. Remember Aluminium wall battens are designed to hold not just slatwall but Art, Pictures and a multitude of other do it yourself uses so dust off that family heirloom from the loft folks. Slatwall panels are delivered on a pallet, with a packing board top and bottom and banded for protection during transit. Please ensure you have scissors to cut the banding and assistance to offload the panels. Next Working Day Delivery available on most standard panels. If you require further information or just a little help please call free on 0800 587 5880.